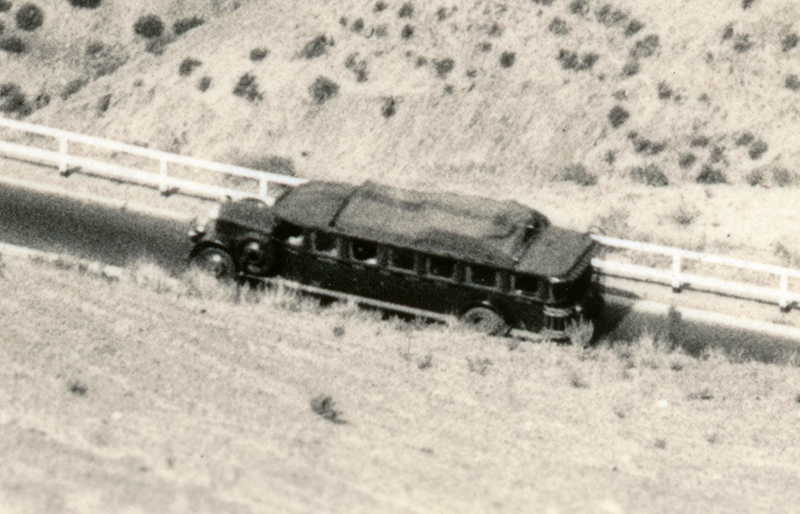 SCVHistory.com LW3278 | Ridge Route | Grapevine Grade and Town, Pre-1936. Grapevine grade on the Ridge Route (north side of the Grapevine), original town of Grapevine at upper left. Unused, undated real photo postcard, undivided back, late 1920s or early 1930s — in any case prior to 1936 by which time a new three-lane, 6.5-mile alignment had replaced the original grade (Harrison Scott 2002:265) and the town moved to its second location about a mile up the road. The Ridge Route followed the old Tejon Pass route into the southern San Joaquin Valley and beyond to Bakersfield. 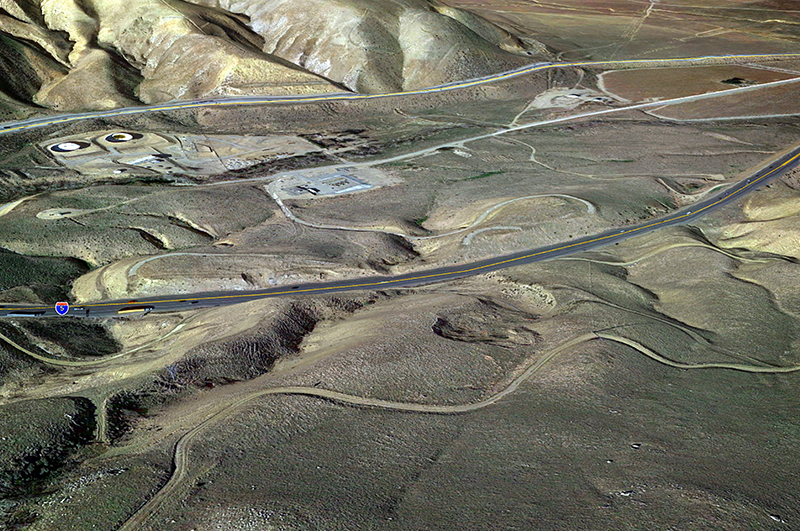 (The other route between Los Angeles and Bakersfield was the Mint Canyon-Tehachapi route.) At the mouth of the San Joaquin Valley, engineer J.B. Woodson, responsible for the Kern County portion of the highway, "had his young men stake out a road alignment on the side of the hill to avoid any problems Grapevine Creek could offer during wet weather. The new road up the canyon was progressing well until March 1914 when Grapevine Creek set a new flood stage and wiped out the entire highway Woodson had meticulously carved from the side of the mountain. He had no choice but to regroup and construct the road at a higher elevation. He did this by using a series of loops and switchbacks to gain elevation" Harrison Scott 2002:222-223). A detour with a 20-percent grade was in effect while the Grapevine grade was paved between November 1919 and May 1921. After it reopened, motorists still faced a 7-percent grade, and the Automobile Club started to receive reports of inconsiderate tourists who stopped along the road and blocked their tires with big rocks and then left them behind for the next motorist to hit (ibid.:85). Another problem was the early automobile engines that would leak oil and grease on the roadway. The slick pavement on the steep incline spelled disaster, especially in the rain (ibid.:206). The small community of Grapevine was formerly located between [today's] north- and southbound lanes of the 1-5 freeway. It was a small community of oil pumping station workers founded by Leonard Lawrence McLarty. Three small derelict 1920 cabins that McLarty built stood sentinel at the old town site until they were destroyed in late 1998 or early 1999 while Pacific Pipeline was attempting to locate a leak in one of their lines. Exiting at Grapevine you can still access a portion of the original highway off to the left of the service road that goes under the freeway to the west side of Grapevine. Turn left from the service road onto Grapevine Road and you will be on the original alignment. Continue south approximately one mile. This is where the original community once stood. The Midway Gas Company had their pipe yard and patrol station cottage in Grapevine. The cottage was located to your left (east) about fifty feet south of where Grapevine Creek passes beneath the small bridge on Grapevine Road. A garage was located behind the house. 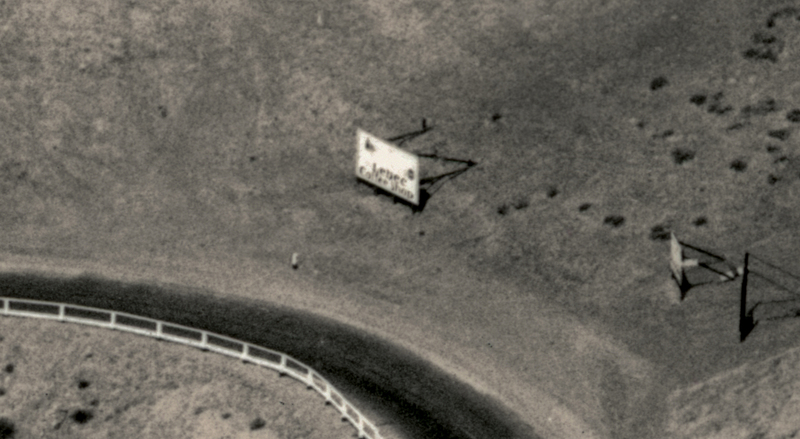 Luther Smart and his wife lived at the site some time after the Southern California Gas Company absorbed the Midway Gas operation. 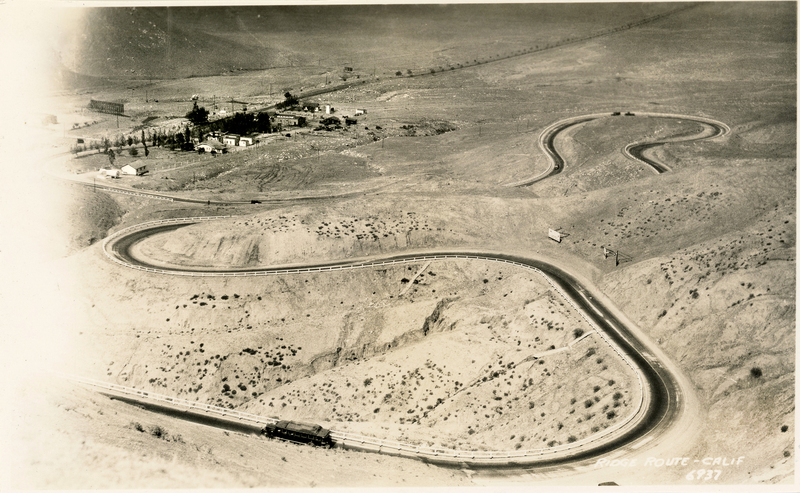 Luther was responsible for patrolling the natural gas lines from Taft to Lebec. A stonewall that once surrounded the facility is the only vestige of the patrol station. The remains of the wall are hidden in the brush. Farther south on the same side of the road is a large cement slab foundation that once supported McLarty's garage. The small cabins mentioned above were also on the east side of the road and south of the foundation. West of the cabin's former site is a small wooden bridge obscured by trees. If you cross over the bridge and Grapevine Creek, you access the old Truempler home and the inactive Richfield pumping station building. The Truempler home is the last remaining Richfield Company house. Originally there were five homes. It is located directly to your right after crossing the bridge. Larry and Dot Truempler occupied the house during his tenure as a pipeline welder for Richfield. Larry retired in 1976. In 1977 he purchased the house from Richfield and moved it off of company property approximately 200 feet to the north, securing it to the former foundation of Pershing School Number Two that was destroyed in the 1952 Tehachapi earthquake. The house is quite nice inside having a large kitchen with two sinks and a large living room with beautiful old woodwork. The living room once served as the cafeteria for the pipeline and refinery workers. High ceilings keep the home cool in the summer heat. The front of the old home has a large, inviting front porch. The house is still occupied by Dot Truempler and her daughter, Nadine Brown. The family moved to Grapevine in 1941. Nadine told me they originally had gaslights as well as electric lights. The pumping plant generated electricity for the station and the company housing. They would shut the generator down at midnight. Google Earth 2018. Click to enlarge. LW3278: 9600 dpi jpeg from original photograph purchased 2018 by Leon Worden.